But of course a new problem exists -- overcrowding and limited resources. Hence the scythedom was created. In this system, men and women are ordained as scythes who must glean around 5 times a week. A gleaning is a legalized killing. Free of malice or motive, scythes must fill a quota of kills, that are statistically backed up. No preference can be shown for gender, race, or appearance. Even some children can be gleaned, since in the time of mortality (a phrase that is used often in this book) some children did die. Into this setting, we meet Citra and Rowan, two teens who are being trained under the same scythe, Scythe Faraday, for the "honor" of receiving the ring and becoming an ordained Scythe. The first rule of being a good scythe is that you not enjoy killing, which is something Citra and Rown have in common. Although the two are being trained as rivals, they form a friendship and complicated feelings for one another. During the scythe conclave, the thrice annual gathering of scythes, unexpected events happen to divide Citra from Rowan, and they both find themselves trained by different people. Their divergent paths and the decisions they make is the subject of this first book. The code of the scythe sets up a world where honorable killings take place. People re-set their age to look younger once they become elderly. There are, of course, bad scythes, who enjoy killing to provide context for why the rules are in place. 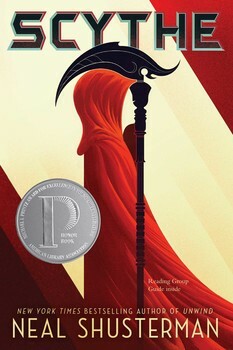 Scythe is Shusterman's compliment to the Unwind dystology. He is the master at creating fully complex characters, unique ethical dilemmas, and creating worlds so utterly believable you will fear they are prophetic. The rest of the story can be found in the 2nd book, Thunderhead.